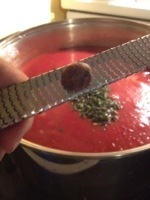 My son’s Facebook status: “there is nothing in the world like waking up to the smell of sauce already cooking. I love being Italian“. It’s many hours and many hand washings later and I can still smell what I cooked all over my hands. And, that’s not a bad thing! 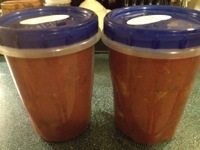 I am using the last of the San Marzano tomatoes I canned last fall. I guess I will need to do more this year! 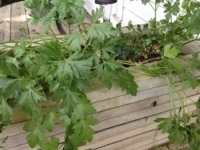 The herb garden is one of the stars of the show. 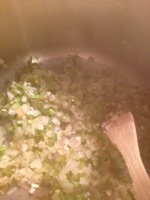 I love seeing the green of the parsley in my meatballs. I’m very loyal. I think Contadina makes a great, consistent product. 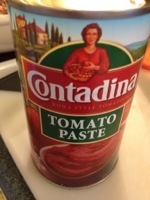 When I don’t have my own tomatoes I always use Contadina. 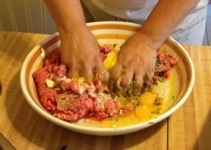 I remember as a girl watching my mother make meatballs. She would shiver with how cold the meat was. Sometimes she would ask me to roll up her sleeves (I learned about food safely as a young foodie!). 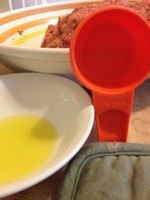 This bowl of olive oil and 1/4 cup measure are my secret weapons while making meatballs. 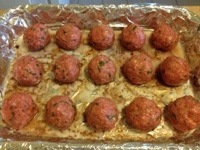 With the eggs, cheese, breadcrumbs and spices I get ten 1/4 cup meatballs per pound of ground meat. It is exceedingly predictable so planning is easy and they cook evenly when they are the same size. Here are those little soldiers, all lined up in a row. The secret here is the pork fat and juice on the bottom of the foil lined pan. Before I even chop an onion or pepper I fire up my broiler, line my heavy 13″ x 9″ baking pan and cook my pork. I used pork shoulder and ribs today. They were big so I cut each into three pieces. Yup, that’s nutmeg. It adds a subtle flavor that no one can recognize. There are six more just like it in the freezer. These two are going to friends.